Google Scholar provides a simple way to broadly search for scholarly literature. From one place, you can search across many disciplines and sources: peer-reviewed papers, theses, books, abstracts and articles. Search results may be from academic publishers, professional societies, preprint repositories, universities and other scholarly organizations. Set Library Links for Cal Poly to access materials the library has subscribed to. Articles available through a Kennedy Library-paid subscription will appear with the words “Find It at Cal Poly” to the right or hidden under the “More” link. How do I set Library Links for Cal Poly? Easiest: Always connect to Google Scholar via the library website. Alternative from off campus: Use the one-click setup or set your Library Links manually under Scholar Preferences. Note: You will be directed through the university portal before accessing subscribed resources. Why use the “Find It at Cal Poly” links? 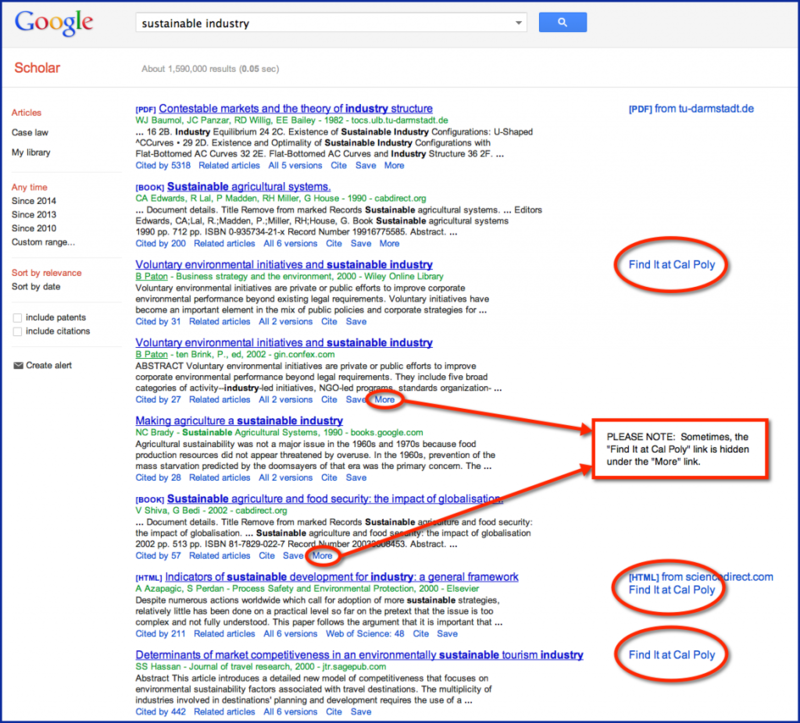 Google may have indexed the search result from a source to which we do not subscribe. Using “Find It at Cal Poly” will check for the requested material in a library-subscribed resource. If the library does not have access to the item you will have the option to request it via Interlibrary Services. For more information, see our How-to guide to Find It. What if I’m asked to pay for an article? Use our Interlibrary Services to borrow materials not owned by Kennedy Library. Sunny Thursday! It's 2:50pm right now.